We help microfinance organizations achieve long term sustainability. 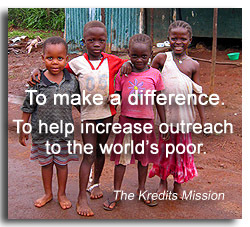 It's the reason MFIs in 30 countries and five continents rely on Kredits technology. For over ten years we have been pioneering the development of technology solutions that enable MFIs around the world to build and operate vibrant operations that today help improve the lives of millions of people. After decades of field experience working with MFI organizations around the globe, we understand the unique challenges they face every day. We also understand that every MFI has its own unique operating challenges, regulatory requirements, and financial goals. This is why we designed Kredits to be highly flexible - so we can tailor a solution to each client’s unique situation and needs. Most important, we work closely with every client to develop new insights about how to improve their operations and bottom-line results. We start with a comprehensive, on-site analysis of the client’s operation to identify opportunities for business process improvement. Only after we fully understand all of the client’s needs and requirements do we commence implementation of our solution. Our comprehensive implementation services include parametization platform installation, data migration, client training, on-site real-life testing, and on-going client services. It’s a proven approach and one of the reasons we enjoy a outstanding implementation record.